The Reina Group are trialling an innovation introduced to the construction industry. 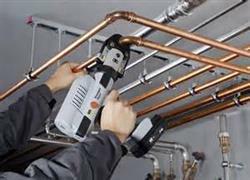 The Viega Press technology uses one pressing tool to connect all piping systems for gas, water, heating and other applications in building construction. This efficient, flexible and space-saving press ring with hinged adapter jaw, enables work to be conducted more conveniently and quickly, and avoids mess. One Tool to connect everything! The press technology provided by Viega enables pipework to be joined in a safer, more economical process and avoids welding which reduces fire risks. It is a great benefit in all types of installation and ideal for detailed plant rooms when fitting heat pumps. It requires one-man installation and can potentially create time saving of up to 80%. The diverse range of requirements placed on plumbing installations with new building regulations and health & safety, are becoming increasingly more complicated. By using Viega components and safe Press Technology will help The Reina Group work efficiently and safely on more complicated piping systems. Steve, one of our senior, Heat Pump Engineers has already worked with the Viega press and confirms that this new method for the Reina Group is ideal, making any installation quick, easy and cost effective. The Reina Group are always looking at new innovations and technologies introduced to the construction industry, to ensure we provide the very newest materials and provide an efficient service which will maintain our position as the number one plumbing and heating company in the South East.